The GIGAmacro Magnify2 system is specifically designed for creating gigapixel resolution imagery of macroscopic and microscopic subjects. 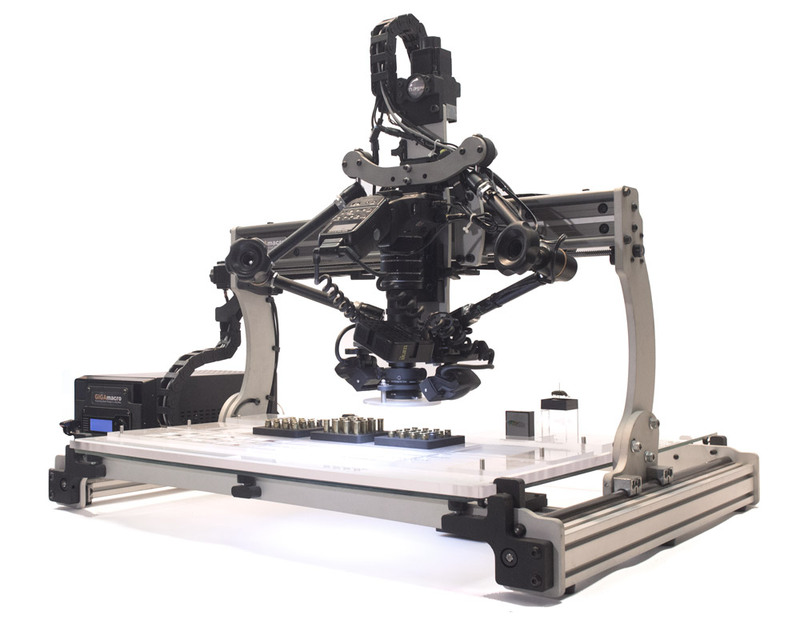 The complete turn-key system provides the robotics, optics, camera, software, and computing power to create gigapixel macro images with ease. It combines the latest imaging advancements, software, hardware, and online gigapixel viewing into one system at an affordable price. The standard system is designed for maximum flexibility and cost efficiency. Depending on your application, the system can be configured with different camera, lens, and lighting options. Custom systems are available for clean room applications, larger subjects, and specialized applications. Imaging Resolution Resolvable detail as high as 1 micron. The system works with many different models of cameras. We typically use and recommend the following cameras. Macro and microscopic lenses are interchangeable on the Magnify2. Determine the level of detail and resolution you need then match that need to the lens. Other options are available, however, we recommend these lenses for most applications. Lighting the subject from the back dramatically expands the capabilities of the Magnify2 system. Use it for digitizing slides, x-rays, semi-translucent parts, or simply brightening the background of your subject. Image multiple subjects in a single batch using digitization templates. Each subject is saved individual project with its own data folder. Use cross polarization to reduce glare on subjects and for special applications such as geology thin section slides. The effect is dramatic and useful for a variety of applications. The finite microscope objectives are telecentric (parallax free), have an outstanding working distance, and produce crisp images. Our Support & Maintenance packages include on-line training for your existing employees and new hires, so that your people and your system are providing the best return on your investment.